Good evening fellow scrappers! I'm a bit late in posting this page. This was done for Color Combos Galore (CCG) Challenge #221. This would be me & my fur-baby Toby. Toby was barely 4 months old here! Sometimes I can't believe that he was this tiny. Now he weighs a whopping 16 lbs! No matter how much he grows though...he'll always be my 'little boy'. Here's the CCG challenge my page is based on. 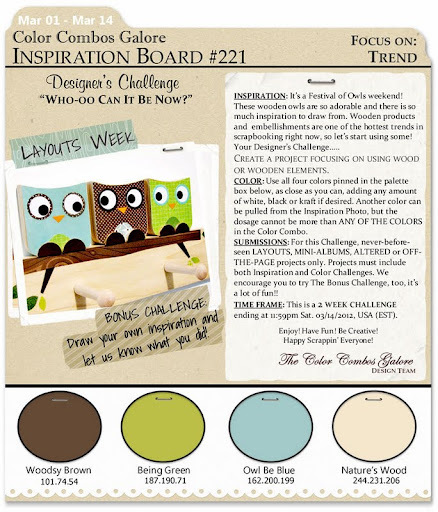 I used all the colors from the palette & incorporated a few wooden embellies & a couple of owls as inspired by the wooden owls in the challenge. The background of the layout was hand cut. I just traced a large scallop mask I have over plain ivory card stock and hand cut it out. I then inked the edges with a bit of Peeled Paint distress ink. The half heart circle is made out of wood. The flocked pup is from my stash. You can see a bit of the hand stitching in this screen shot. I once again combined the zig-zag stitch with the straight stitch to add a bit of texture. The brown flourishes going straight down my page is actually a stamp by Hampton Art. The corner grunge stamp is by Stamp Enjoy. I first stamped the image onto a transparency with black Staz On and then cut it out. This way I was able to place the image exactly where I wanted it. The triple owls is a stamp by Sideshow Stamps. Like my corner stamp--the owls were stamped onto a transparency with black Staz On and then cut out. TIP: stamping images on transparencies allows you to place your images wherever you wish. Just remember to use a permanent ink like Staz On or else your image will smear. The large owl sitting in my vine is a glimmer glass by Tattered Angels. The vine is a Color Me vine by Petaloo...it was spritzed with a bit of blue glimmer mist & then randomly inked with some Weathered Wood distress ink. Finally, I further decorated the flowers on the vine by lightly adding a bit of clear Star Dust Stickles along the edges of the flower petals. Here's a closeup of the stamped flourishes added along the border. The little fence is also made out of wood. I added a bit of tulle to the large flower (by Prima) in order to soften the layout a bit. The script seen here is a stamp by Donna Salazar called 'All My Love' & the mulberry flowers are from my stash. Thanks for stopping by & do pay CCG a visit to see the other DT's interpretation of this challenge and to play along for a chance to win some goodies! Hermoso Kay! todos los detalles exquisitamente conbinados , Me encanta el diseno!! y no podian faltar las owls! Toby un precioso!! Absolutely stunning and don't you just love stazon and transparency its so versatile. Just beautiful Kay...love the colors and your cute embellies! Amazing layout Kay! I love all the detail you give!! Love this design and the bright colors! There's something different in your work. :o) Fabulous!